Projects. Here you’ll find all of your projects and tests. Lists. As an enterprise user, you’ll be able to manage your internal lists to send tests out to your specific audience. Teams. As an enterprise user, you’ll also also be able to manage teammates within your Team Account. Fresh and Clean. We brightened up the colors to make the experience a little more crisp and pleasing on the eyes. Clearer Metadata. We’ve made information like number of total responses and number of filtered responses clearer. 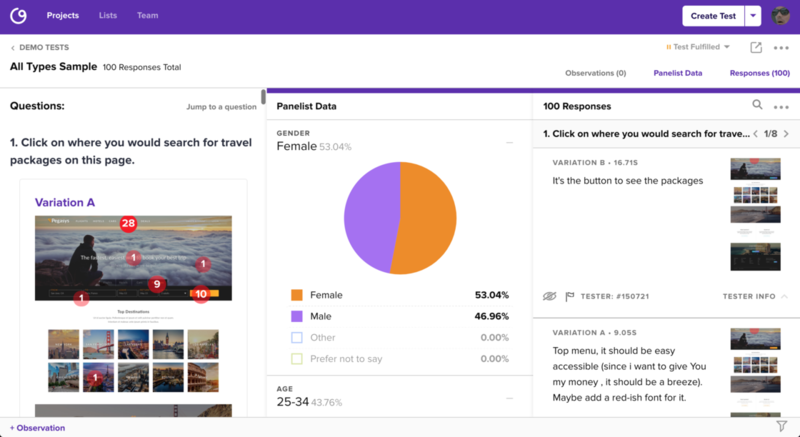 Design Insights Are Now Observations. As we’ve been honing in our Advocacy methods at ZURB, we’ve updated the terminology of how we record data within the app -- we’re calling these Observations which are used to get us to Design Insights. Security Updates. We’re staying up-to-date with the latest patches for the Meltdown and Spectre exploits as well as updating to Ruby 2.5.0. Improvements Under the Hood. We’ve also moved to a more sustainable flexbox approach the CSS and improved the underlying architecture for the app. Updates can be released faster than ever! The Helio Team is really proud of the new updates and want to make sure we’re delivering the best experience for you! Have any questions or issues? Email us at [email protected] so we can help you out!